GrabHitch: Join the biggest social carpooling community! GrabHitch is a non-commercial social carpooling service that matches you with people who are going along the same route. And the best part! 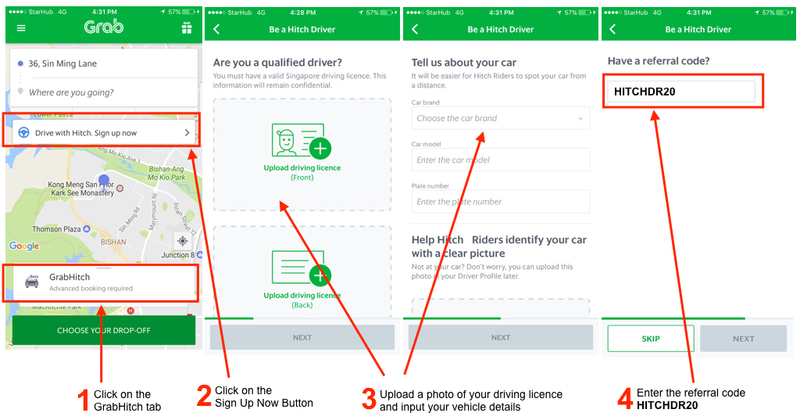 Anyone with a valid driving license can sign up under 5 minutes – right from any mobile device. There is absolutely no additional registration involved, nor any obligation to do rides on a regular basis. From now till the end of August, get $20 credit when you sign up and complete your first ride as a GrabHitch driver with referral code HITCHDR20! What is so special about GrabHitch? Being the BIGGEST and fastest growing community means we have the largest pool of drivers and riders who believe in the cause of social carpooling. Do your part in reducing carbon emission and traffic congestion, while recovering your petrol costs and making new friends! Not forgetting, our additional driver perks. Receive exclusive merchandise, save on motor insurance, petrol, and many more! You will be able to find passengers easily on our app – you can filter passengers by distance, time and even gender so you don’t have to go out of your way just to pick up/ drop off someone! Unlike other carpooling services, GrabHitch has regular driver incentives to reward you as and when you drive with us. We are the ONLY social carpooling service in Singapore that has purchased additional motor insurance that covers our riders in the event of an accident. In the event of an unfortunate accident during a Hitch ride, your personal private motor insurance should usually cover the costs incurred from the accident. Specifically, four major insurers (Income, AIG, MSIG and Aviva) have confirmed that they will cover GrabHitch rides, provided you abide by LTA’s carpooling regulations of not more than 2 carpooling trips a day. In rare cases where your private motor insurance does not pay out (e.g. passenger gets hurt by sudden braking but there was no accident), Grab has also recently extended our Group Personal Accident Insurance (PAI) to paying GrabHitch riders in Singapore at no additional cost. The PAI for GrabHitch riders is Singapore’s first insurance that not only covers accidental death but also medical expenses that are incurred in the event of an accident on social carpool rides. This means reduced risk for drivers! This incentive is only eligible for new drivers who sign up and successfully complete 1 Hitch ride as a driver between 15th August 2017 @ 00:00 hours – 31st August 2017 @ 23:59 hours. New drivers must sign up with the referral code HITCHDR20 in order to qualify for the $20 credit incentive. The processing of the $20 credit into your GrabHitch driver wallet will only be conducted after the incentive period has ended (post-31st August 2017).